As I continued my journey with Jamie’s America cookbook to the South part of U.S., I found more comfort food and some are more sinful. “Deep fried”. 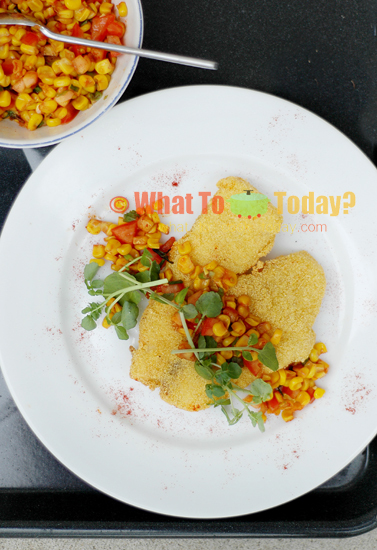 The thing about this crispy fish and corn salsa though, even though it is deep-fried, I’m surprised by how non-greasy it can be. 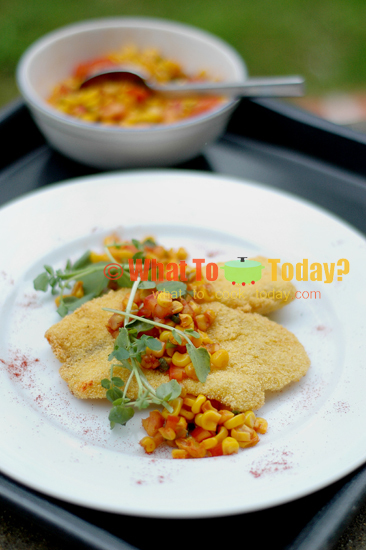 The fish was marinated in buttermilk and dredged with cornmeal and deep-fried quickly for about 2 minutes. Blot it with paper towels and that really do wonder. 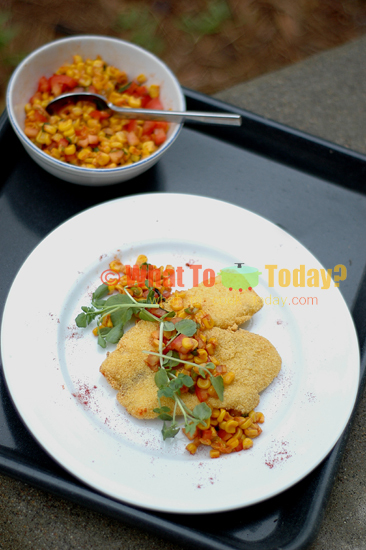 I really love this crispy fish and corn salsa. I strongly suggest using corn meal instead of regular flour because that’s really add the extra crunch to the fish. Suitable fish for this dish can be fillet of branzino, snapper, cod, turbot, pollock, haddock and avoid oily fish for this recipe. Even scallops are good if you cook it like this. The corn salsa itself is so flavorful. I like the idea of seasoning the salsa with soy sauce. That’s one of the reasons I like Jamie Oliver’s recipe because he always infuse flavors from different cultures and they always work wonder. The salsa tastes better the longer it sits.